The Blue Line will undergo a comprehensive $350-million modernization beginning Jan. 26 to improve reliability, enhance safety and improve the customer experience. The Blue Line south closure, from Willowbrook/Rosa Parks Station to Downtown Long Beach Station, will take place from Jan. 26 to late May. During this time, trains will be replaced by Metro bus shuttles. The Blue Line will continue running between 7th St/Metro Center and 103rd St/Watts Towers Station. Green Line service at Willowbrook/Rosa Parks Station will not be affected. Metro will offer three types of Blue Line Bus Shuttle Service during the closures. Not all the bus stops are at the rail stations — please see map with bus stop locations listed under each station. It will speed your trips to go directly to the bus stop. The timetables are linked below. • Blue Line Local Bus Shuttle Service (862) will be free, with buses serving all closed Blue Line stations. The shuttles will run the same hours as the Blue Line, seven days a week. • Blue Line Select Bus Shuttle Service (861) will have a $1.75 fare and serve busier stations during the morning and afternoon rush hours. Customers with a valid TAP card can transfer for free to the Blue Line or other lines within two hours of starting a trip. Select Bus Shuttles will run Monday through Friday from 5:30 a.m. to 9:30 a.m. and from 3 p.m. to 7:30 p.m.
• Blue Line Express Shuttle Service (860) will have a $1.75 fare with limited stops between Downtown Long Beach and Downtown Los Angeles during morning and afternoon rush hours. Customers with a valid TAP card can transfer for free to other lines within two hours of starting a trip. The Express Bus Service will run Monday through Friday from 5 a.m. to 9:55 a.m. and from 3 p.m. to 7:30 p.m. Please note that the end-to-end trip will take about 75 minutes. There will be signage at closed rail stations showing the way to the bus stops and Metro staff on hand to provide assistance. What’s being done to fix the Flower/Washingting junction? 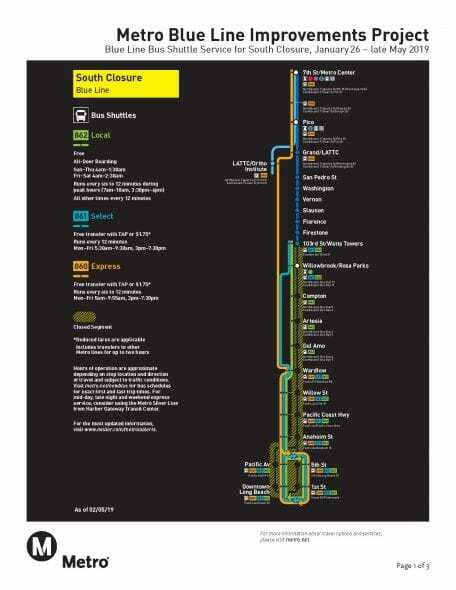 so if I am reading this right, Saturday night/ Sunday morning the last blue line train leaving 7MC to Long Beach has always been 210AM for the past year or so. If I was to take the last train, I would miss the shuttle bus and be stuck in watts at 230AM! You should be able to take the last train at 210 from 7MC and be able to still make it to DTLB. We sure could use some information at the Information Desk at Union Station. As of Monday we had one, (1), uno flyer about this major service change. We have 10,000 flyers on the artwork of the Gold Line, but one, (1), uno flyers on this. I think you could do better. Roy Wojahn, volunteer at Union Station. Thanks Roy! We’ll let the project team know and see if we can’t drop off a box at the info booth. Curious question: Are the train drivers also qualified to operate these bus shuttles themselves — or are special personnel employed on a temporary basis for that purpose? Rail and Bus are ran differently, this is why in the past the shuttle buses have been such a nightmare- lack of communication between the two. This time around Metro is treating the shuttle buses as actual bus lines (line 860,861, 862). they have even been seen driving training buses along the routes. For certain bus lines that now end at Artesia Station, namely 60 (daytime), 260, 762, would Metro consider extending them to Downtown Long Beach during this phase one closure, as an option for some passengers, who would need to take the 862 shuttle? Not surprisingly, Metro also forgot to verify whether the existing Blue-Line train schedule will continue to be followed on the stretch between 7th St. and 103rd St. stations while Metro is supposedly busy making improvements on the south half of the Blue Line. For the duration of this year’s two separate four-month-long Blue-Line shutdowns (i.e., first of the south half and later of the north half of the line), Metro should try to work something out with Long Beach Transit to allow Metro to provide frequent Line 60 and 760 buses over the entire distance between DTLA and DT Long Beach. This has been requested in Metro meetings, but so far ignored–probably because, as usual, Metro thinks “NIH” (Not Invented Here). My first trip on the “Select” bus (861) + Blue Line took 85 minutes, from Wardlow station to 7th/Metro station. The shuttle bus itself took 40 minutes from Wardlow to Watts, because it took a *very* long route. Not sure why the 861 gets off the freeway at Rosecrans and uses surface streets all the way to Willowbrook. The 105 freeway is likely to be faster even during rush hour than waiting through all those traffic lights.